We are Wesley and Jensen Lewis (cousins) and we decided to start a business called JWparagoods selling survival bracelets. At first we wanted to just make money, but then realized that helping people would give us a lot more joy. 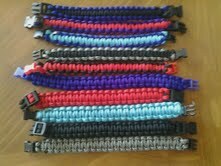 So we decided to use our handmade survival bracelets to help people in Africa. Our mission is to provide survival bracelets and to raise $500 to build our first well in africa! SAVE YOURSELF...SAVE OTHERS! With survival bracelets from JWparagoods, and by donating to our water project that provides villages in africa clean, fresh water. You can prevent disease and improve the quality life of children in other parts of the world, and have a cool survival tool for yourself at the same time. HOW? The first 50 people who donate $10 dollars to the JWparagoods water project will receive a free JWparagoods survival bracelet. When we hit our goal of $500, we will be able to build our first well in Africa. Click on the "Donate" button to the right and follow the instruction. You can donate more than $10 if you would like to help us even more with meeting our goal. AFTER DONATING Send us (forward) your email receipt saying you donated to JWparagoods water project by email at [email protected] That email should also include your name, phone number, home address, email, color of bracelet (purple, black, green, grey, red, blue, or turquoise), and the size (small 7", med 8", or large 9") and we will contact you to confirm. 07/17/12 Wade Peck $10.00 Way to go! 07/17/12 Pam Hoyle $10.00 Way to go guys! 07/17/12 Joe Simons $10.00 Way to go boys! Proud of you! 07/17/12 Jason Potter $10.00 Keep up the good work! 07/17/12 Maggie Price $10.00 What a great project! Thank you for doing it. 07/17/12 Mark Jones $10.00 Wesley and Jensen - you guys are awesome! 07/16/12 Dan Lewis $10.00 Good job Jensen and Wesley!